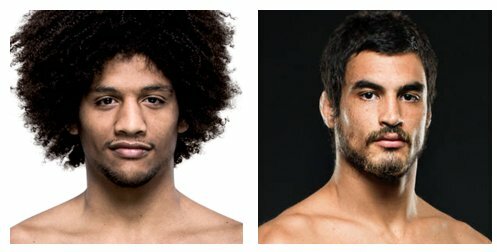 Unless something changes in the schedule this week, Alex Caceres vs. Kron Gracie will be the 5000th UFC fight. In 12 of Cain Velasquez's 16 UFC fights (75%), his opponent landed less than 10 significant strikes per FightMetric. He was 11-1 in those fights. I don’t think I can pass on N’Gannou at + money. One of my golden rules in sports betting of any kind really, is to never bet on the unknowns. Whether it be a backup never before seen quarterback, and up and coming pitching prospect, or in this case, which version of Francis Ngannou we will see. There’s more than just that unknown as well as we have no idea what version of Cain Valesquez we will be treated to at this juncture of time. The tail of Francis Ngannou is that of a cautionary one, in that he is a breathing example of what happens to a UFC fighter when too much is given too soon. Ngannou was the best heavyweight prospect the sport had possibly ever seen and was leaving bodies in his wake during his clime to the heavyweight title chance. Fast forward to that title fight and we saw the most dominant title performance pillar to post I’ve ever seen, it just wasn’t for Ngannou. The issue here is it wasn’t just an off night, Stipe Miocic provided the rest of the UFC with the blueprint to beat Ngannou, and it’s wrestling. Ngannou then followed that performance up with an even worse one, where he was literally so petrified of the thought of a takedown, he was unable to throw a punch in a huge black eye moment for The UFC. Ngannou rebounded with a 45 second KO victory of Curtis Blaydes, and if he ever wants to be mentioned in the title picture again, this is now the biggest fight of his career. I can’t trust him with my money, but I’m rooting for the guy, after all, I have a thing about buying stock at all time lows. I understand where the line is where it is in this fight, I just don’t really agree with it. On the surface, these two fighters are so similar stylistically, the pick line makes sense, but there’s one glaring advantage for James Vick, and that’s fight IQ. Fight IQ to me is first and foremost the number one thing I put the most stock in, and if you don’t have it, I refuse to bet on said fighter. That is something of the case of Paul Felder, who seems to crumble when lights are the brightest. Yes, you can make the argument Vick just crumbled in his last fight in which he was humbled by Justin Gaethje, but it was must win for Gaethje and things happen inside an octagon. This is likely to be a violent stand up striking attack with a lot of dirty boxing up against the cage mixed in, which brings me to the next point, Vick has a huge size advantage, which he should be able to use in this type of fire fight. That, and he’s one of the best mental fighters in the game, and I’ll go with James Vick. Both women are attempting to break into the title picture in this fight as they jockey for position. Stylistically this line is pretty fair, as Calvillo is coming off her best performance in The UFC to date via a first round submission victory, and well, we know what to expect from Courtney Casey. She’s a huge strawweight with good wrestling and decent punching power, she is just incredibly timid and something seems off more mentally then physically, which in keeping with the theme of this preview, I can’t trust mentally weak fighters, and until Casey gets more aggressive, I can’t pick her. Casey is certainly an example of a fighter with all the tools, she just has to put them together, and she could surprise in the division if she’s able to turn the corner, I just can’t pick her until I see her do it first. This is another situation in where I understand why the line is where it is, but I don’t really agree with it, strictly out of principal. Gracie has the famous last name of Jujitsu royalty you’ve probably noticed if you’re reading this article, and he’s a submission killer. That being said, he’s vastly unproven and raw in every other area of his game, fighting primarily out of Japan as of late against frankly awful competition. The UFC is setting up Gracie to win here in exciting style, to be blunt, because they’re giving him the UFC fighter with the biggest name that stylistically is most likely to get tapped out. Alex Caceres is an above average to average UFC fighter, always hovering around the .500 mark, but his weakness has always been the submission defense game. Enter Gracie, who may already do that better than anyone in the division, and you can see why it’s a -330 betting line. I wouldn’t make a habit out of parlaying guys like this so raw and new, but its clear what The UFC is trying to do here. Paths to victory is the name of the game, and frankly, Luque just has more. Bryan Barberena, for all his faults, finds ways to win as a big underdog in The UFC, which can never be over stated, and for that, he’s on my do not bet against list. That being said, as is the case in every Barberena fight, his path is one dimensional, it’s the knockout. This fight can be a fire fight back and forth, but Luque would be wise to stay away from Barberena’s hands and look to point fight his way to a victory because Barberena has never shown that capability. This fight will most likely be a point fight type of victory for either fighter and whoever is able to dictate pace or has the cleaner striking and exchanges will most likely take this fight. The thing is, truthfully these fighters are almost mirror images of each other stylistically and I’m not sure which one of those are going to be able to do so. It’s very likely going to be a split decision or a close 29-28 type of decision for either fighter, and even though odds aren’t released at this time of this writing, I’m playing it safe and going Over 2.5 Rounds as they should neutralize each other. Sterling was always one of those guys who had all the tools and just wasn’t able to put it together, until now. He’s certainly had and up and down career inside the UFC’s octagon, but he’s certainly on the “up” side of that as things stand now, and I actually look for him to continue his run. Length is everything in this fight and no one usually has more of it than Sterling. Rivera certainly has the striking advantage, but if Sterling can get this fight to the mat, he should be able to use that elite wrestling and submission game. This fight is all about what happens when things don’t go your way, specifically in the case of Manny Bermudez. Bermudez has been dubbed the “Bermudez Triangle” long before coming to The UFC, and has made it come to fruition in the UFC by tapping out both opponents with said Bermudez triangle choke. My worry for him in this fight is, this is the most well rounded fighter he has faced to date, and I don’t think Bermudez is as far along with the rest of his game than people think. If Bermudez can’t get the submission, every other area in this fight I give the edge to Benito Lopez. Short notice replacement Andrea Lee takes the place of Lauren Murphy on two months notice in this matchup. Lee has struggled against takedown artists and Evans Smith does have the wrestling advantage on paper, but Lee’s kickboxing is far more effective than Evans Smith and should coast to a decision here. 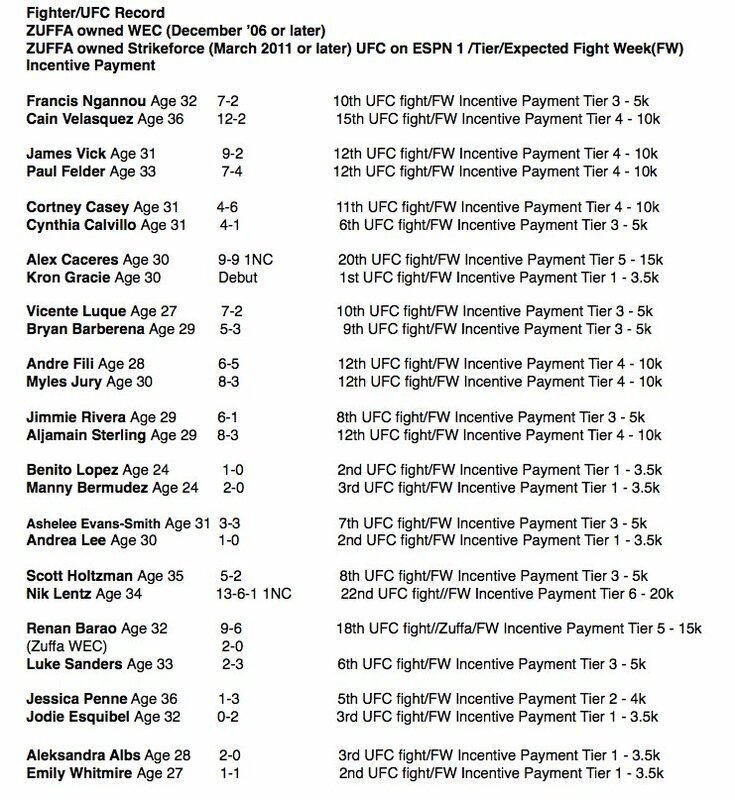 Holtzman is certainly evolving as a fighter which is exactly what you want to see. He makes mistakes in one fight but fixes them for the next. He struggled badly against Josh Emmett yet turned those same tricks against Alan Patrick. Holtzman is changing and evolving into a better fighter while Nik Lentz, always capable, is something of a predictable fighter at this stage. Lentz could turn this into a fire fight or go for his famous submission game, but I just think Holtzman is going to be even better than the last time we saw him, which doesn’t bold well for Lentz being able to get him to the ground. I’d like this alot better if Holtzman was an underdog though, the line is banking on him being even better than last time out as well. Esquibel was thought to have turned a corner in her MMA career very recently and frankly, she let a lot of people down. Penne, on the other hand, has also somewhat been a bit disappointing, although her career looked to be heading the way of championship gold. Takedown defense is the key here, as Esquibel is a huge question mark while Penne’s grappling is her biggest strength. Penne is certainly getting up their in age as well, but I just can’t trust Jodie Esquibel until I see it. Remember that fight IQ thing I talked about with Paul Felder? Luke Sanders wishes he had half the fight IQ of Paul Felder. To make this simple, Luke Sanders is the most mentally weak fighter on The UFC’s roster and a firm do not bet on, but on the other hand, Renan Barao is making his case for the most washed up fighter in The UFC. A real Sophie’s choice type of fight here, it screams stay away. That being said, I can’t ever chose Luke Sanders, so I’ll go with Renan Barao. The certain jerker of the evening, this one is really a coin flip in my eyes, and don’t see how anyone can find much of a betting angle. Whitmire looks over matched at times, and if Albu comes in with the right game plan, which would be to dictate the pace by walking her down most of the night via strikes, that’s probably the most likely of outcomes. Whitmire can certainly stuff takedowns as we saw last time out, and these girls are just so close in skill level. The UFC’s main attraction on ESPN smacks of a similar tone as previous promotional debuts with this Sunday featuring the return of former heavyweight champion Cain Velasquez. And akin to the organization’s inaugural FOX fight, this matchup, too, will likely hinge upon the level of aggression Velasquez brings to the table. Like many wrestlers who make the transition to mixed martial arts, Velasquez is a pressure fighter at heart. Demonstrating an acute awareness to move his head from left to right since stepping onto to the UFC stage, Velasquez utilizes an efficient economy of movement to throw his strikes. Continually slipping off the center line, the former champ will come right back on balance with various levels of punches and kicks in combination. When feeling in stride, Velasquez launches an overhand right that seems to find its way around guards and works in multiple scenarios for him. Still, no matter how disciplined Velasquez means to be with his kickboxing fundamentals, the 36-year-old veteran is inherently at risk for counters by the mere nature of his aggression. And given Velasquez’s current counterpart, the cost of a counterstrike comes with a hefty bill. A Cameroonian-born Parisian who practically came from nothing, the rise of Ngannou has been fascinating to watch. A dangerous striking threat who lists himself as an orthodox fighter, the 32-year-old standout occasionally will fight from southpaw when facing wrestlers (though he really didn’t need to in his last outing). Not only does the southpaw stance allow a little more play in the distance department, but it also somewhat limits the shot selection on his opposition, as well as opens up opportunities to land his counter left cross. When fighting from orthodox, Ngannou still prefers to conduct traffic from his left side, throwing straight or varying his patent up-jabs and check-hooks. Utilizing feints and pivoting well within close quarters, Ngannou also keeps a good sense of space, managing distance firmly when he chooses to. However, as impressive as Ngannou’s movement is, he, too, is not beyond being hit or countered with wrestling shots while coming forward, which is what makes the striking dynamic of this battle a compelling one at all ranges. Between Ngannou’s failed bid for the heavyweight belt against Stipe Miocic and Velasquez’s successful title defenses against Junior Dos Santos, it’s not hard for one to surmise a strategy to help blossom the dynamic of this matchup. Velasquez, who gets a surprising amount of his fights to the floor via knockdowns, possesses a diverse takedown arsenal that Ngannou may have to deal with. Similar to American Kickboxing Academy stablemates Daniel Cormier and Khabib Nurmagomedov, Velasquez can seamlessly chain from single-legs to tosses in close quarters. And carrying over his awareness for head position, the former Division I standout does a good job of keeping his forehead pressed into his opponent’s chin (ala Randy Couture-style), which helps him dictate the position with both strikes and leverage from his underhooks. On the floor, Velasquez produces nightmares that probably stay with the opponents who have had the unfortunate experience of being cooked in that hellacious kitchen. A highly skilled grappler who owns a Brazilian jiu-jitsu black belt, the former champ prefers to break down what he catches with unrelenting wrestling rides that are accompanied with strikes that come second nature from almost every position thrown. And though I could see Velasquez putting those skills on display come Sunday, grounding Ngannou is not the easiest of paths – despite it seeming like an obvious one. The MMA Factory product is not-so-deceptively strong inside the clinch, commanding a solid base and balance for a man of his size. Ngannou shows the competence to try and keep his opponent’s arms separated during their takedown attempts, as well as a decent sprawl in open space. Even when on the wrong end of a beatdown against then-champion Stipe Miocic, Ngannou had quiet moments of success, where he, at the very least, was able to demonstrate that he knew the proper fundamentals of defending from the fence or using the cage to stand (when he wasn’t utterly exhausted, of course). Nevertheless, Ngannou will need to display a prolonged urgency if he means to compete with the active and unforgiving rides of Velasquez, who will without a doubt be trying to attrit his Cameroonian counterpart. 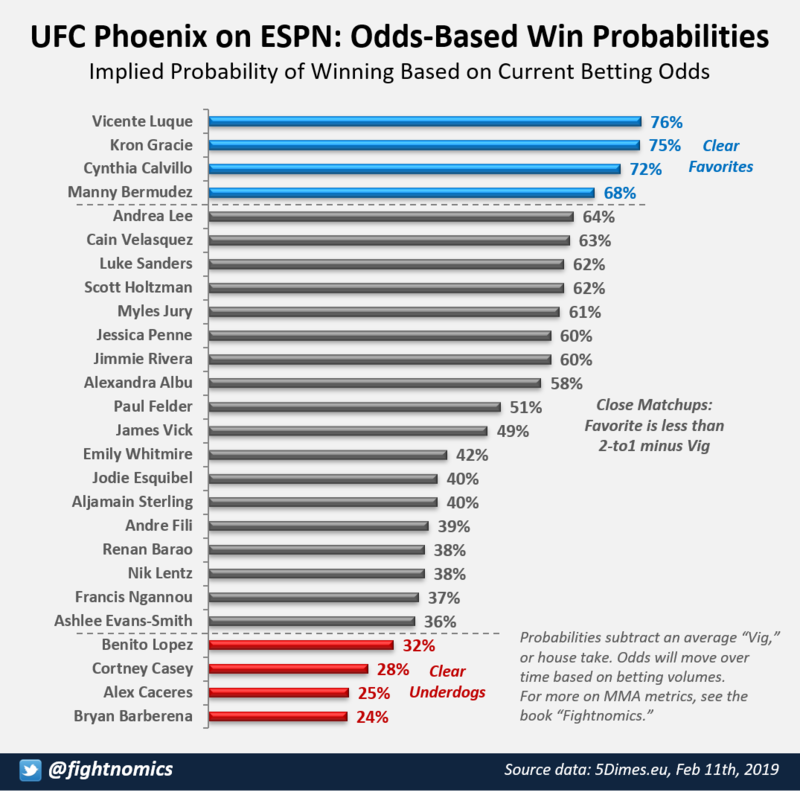 The oddsmakers and public seem to be siding with the former champion, listing Velasquez -160 and Ngannou +140 as of this writing. This line initially opened wider in favor of Velasquez but has tightened during fight week with money coming in on the underdog Ngannou, and – despite my official pick – I can completely understand that sentiment. Sure, stylistically speaking, Velasquez should win this kind of matchup roughly 7 out of 10 times. However, we have also seen Velasquez lose this type of fight the last time he was featured in a similar spot — which, in hindsight, spookily resembled Ngannou’s most recent win over rising wrestling threat Curtis Blaydes. Factor in the former champ’s 30-month layoff, and I don’t blame anyone for taking the shot on the dog here. However, one could also argue that time off for what was an injury-riddled world championship-level fighter is not necessarily the worst thing in the world – especially if you are a heavyweight (a weight class that is traditionally kinder to aging athletes). Though Velasquez seems to own his losses, you can argue that his poorer performances were, in part, a result of rushing a product to market. Now that he has taken the time to do it on his own timetable, I suspect more positive than negative in regards to his health. And as far as his potential performance goes, I imagine that AKA – for all its criticisms of hard sparring sessions – is the perfect gym to shake off the rust from this type of layoff. Ultimately, it’s a heavyweight MMA fight, which means I’ll be keeping my money away from it. 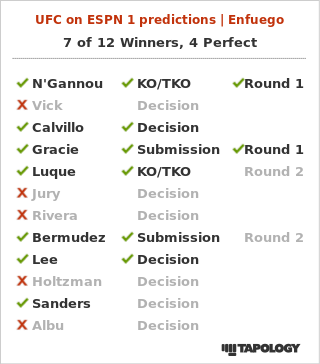 If Velasquez can navigate the first round without getting sent into the Shadowlands, then I like his chances to attrit the durable Ngannou down the stretch of a five-round affair. Fighting out of Mineral Wells, Texas, the 31-year-old Vick made his UFC debut in 2013 after losing in the semi-finals of The Ultimate Fighter 15. Vick has gone 9-2 in the UFC with both losses coming via knockout. Vick has a well-rounded, if incomplete, game. He’s capable of finishing the fight inside the distance with both his striking and his grappling. “The Texecutioner” has two knockout wins and three submissions in the UFC. He’s won via decision four times. Vick’s UFC tenure has been characterized by streaks of victories broken by a single brutal loss. Vick had won five UFC bouts in a row prior to his knockout loss at the hands of Beneil Dariush and subsequently won four UFC fights before being knocked out by Justin Gaethje last August. Philadelphia-born Paul Felder has been fighting in the UFC since October 2014 and has gone on to become one of the most exciting fighters in the UFC’s lightweight division. Felder is 8-4 in the UFC. Coming into the organization primarily as a striker, Felder has knocked out four of his opponents, submitted one, and scored a decision victory twice. He has lost by decision three times and once by doctor stoppage (cut). Felder is looking to rebound from a grueling decision loss to Mike Perry last July. That fight, which Felder moved up to welterweight for and took on short notice, snapped the best winning streak of Felder’s UFC career at three. Vick’s striking game is defined almost entirely by his abnormally large frame. Standing at 6-foot-3 and possessing a 76-inch reach, the Texan has been the taller and longer man every time he has stepped into the Octagon. That will not change against Felder. Vick prefers to strike at range where it is much easier for him to hit his opponents than it is for them to hit him. He lands 4.16 significant strikes per minute and outlands his opponents by 1.11 significant strikes per minute. He has power in his hands and has scored a knockdown in each of his last three wins. The former Golden Gloves champion utilizes a very active jab that has been improving between fights. Vick also likes to throw naked kicks, particularly leg kicks and a slick body kick. Defensively, Vick’s striking is lacking. He keeps his head up and on the center line, making it dangerously reachable for pressuring opponents. “The Irish Dragon” Felder came into the UFC and quickly made a name off his flashy striking. He’s a high-output striker, having thrown 8.19 significant strikes per minute over his UFC career. While Felder’s game can look brilliant in pieces, his big flaw is a lack of cohesiveness. Facing a skilled striker at range, Felder tends to become repetitive. He will attempt the same low-percentage strikes repeatedly when his opponent doesn’t give him openings to work with. These strikes look very impressive when they succeed but can allow Felder to let fights slip away from him. Though Felder is ostensibly a striker, he’s achieved his highest-level success in the UFC as a powerful grappler and clinch-fighter. In Felder’s most impressive win to-date (over current No. 14 lightweight Charles Oliveira) he showcased an extremely talented grappling game. Felder rarely pursues the takedown – attempting only 0.36 takedowns per 15 minutes – but has excelled on the mat when forced to fight there. In the Oliveira fight, Felder scrambled through multiple submission attempts by the most accomplished submission specialist in UFC history. In both rounds, Felder wound up in top position and was able to deliver brutal ground and pound. As Felder has developed, his best moments have come in close quarters. Every fight in his recent three-fight win steak – including finishes over Oliveira, Stevie Ray, and Alex Ricci – featured Felder hurting his opponent up close. The Philadelphia-native has incredibly dangerous elbow strikes capable of finishing opponents in the clinch and from top position. Vick attempts just 0.32 takedowns per 15 minutes. Vick successfully defends only 56% of takedowns. 77% (7/9) of opponents that attempted to take Vick down were successful. Vick has only landed a takedown when his opponent attempted one first. Part of Vick’s poor defensive wrestling is that he is very comfortable falling to his back to attempt a choke. Vick’s height makes it easier for his opponents to get in on his hips but also provides him with leverage to attempt front headlock chokes (guillotines, d’arces, etc.). On the feet, Vick’s clinch game is again defined by his height. Vick’s long limbs allow his opponents a wide window to attach through; Vick is very susceptible to powerful strikes when his opponent enters the clinch. Once in the clinch, however, “The Texecutioner” uses his long limbs to smother his opponents and prevent them from doing much. The fight will be decided by the distance it takes place on the feet. Vick wants to stay at range where he can actively land with his jab and snipe his opponent with kicks. Felder is often content to stay at range but would be best served by pressuring Vick and attacking him in the pocket/clinch. As mentioned above, neither man pursues the takedown out of their own volition. It’s unlikely this fight heads to the mat without someone being dropped on the feet. Both men find themselves in another closely-contented bout. After opening at +135, Vick currently sits as the slight favorite at -120. Vick has been the favorite entering five of his last six, but four of those fights (including this one) were -135 or closer. Felder is currently dead-even at +100 after opening at -175. Felder has been between -165 and +155 in five of his last six, indicating close matchups. My guy scanned the markets and there is little volume and few wagers of any size. Best he could find for "known" action is a "UFC only" bettor who took Luque for $8,500 from -385 to -442 to win $2,100. I read that. This is a tough card to predict.